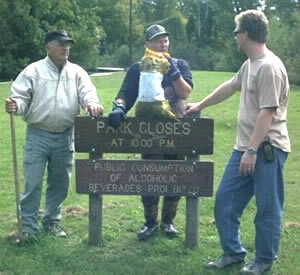 The member of the Central Texas Flyfishers are concerned about the environment. 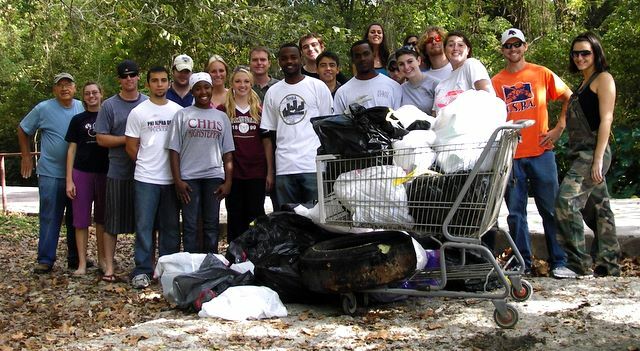 We actively participate in local river cleanup efforts, as well as support the ideals of "packing out more than we take in," and never taking or keeping more than we can use. We share these principles in our education efforts as well. Many hands helped us with the Fall 2007 San Marcos River Clean-up. The Club has adopted the stretch of the San Marcos River that runs through Stokes Park, just east of I-35. Over the years we have recovered many interesting things from the river, including washing machines,shopping carts, automobile parts, and even a rubber toy alligator. We have been participating in River Clean-ups since our formation. Left:Bill Wofford, Terry Blackwell and Matt Jennings discuss how to best pool their efforts. 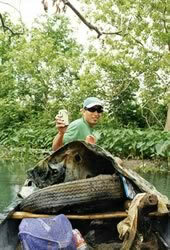 Left: Marcus Rodriguez, doing his part cleaning the San Marcos River, holding yet another beer can. 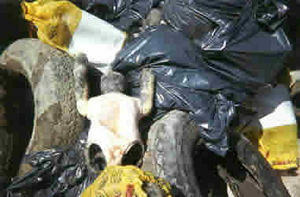 Right: Some of the litter our club retrieved from the River in and around Stokes Park. 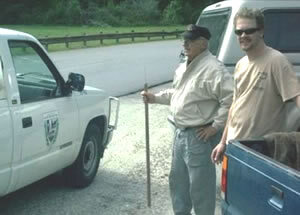 Billy Wofford heads our conservation efforts.